Useful Maps Explaining Florida's Judicial System В сложной финансовой ситуации приходит на помощь кредит наличными в Казахстане. 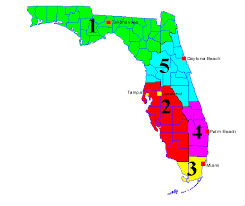 For more information on Florida counties, take a look at the useful maps that will tell you the cities located within each county. For more information on Florida’s judicial (trial court) circuits, take a look at this map and the corresponding links to the judicial circuits. For more information on Florida’s appellate districts, take a look at this useful map that will identify the judicial (trial court) circuit and counties that fall within each appellate district. For more information on the federal district courts located in Florida, take a look at these useful maps that will tell you the counties located within each federal district court.